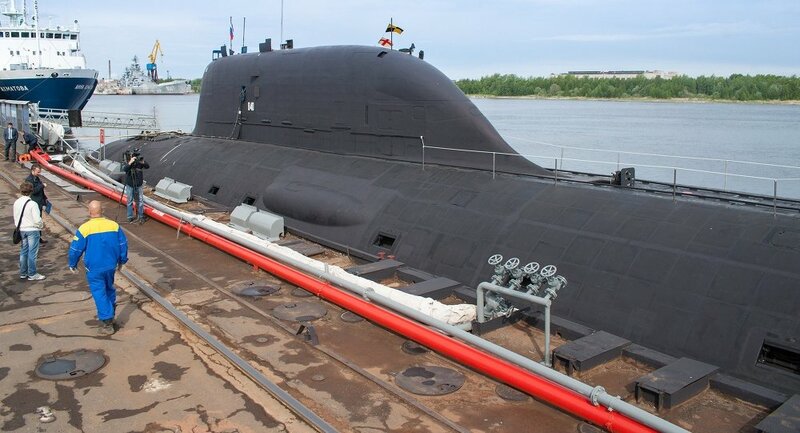 Seventh Yasen-class submarine will be laid down in July next year, according to the Sevmash shipbuilding company'd Director General Mikhail Budnichenko. SEVERODVINSK (Sputnik) — Russia's seventh Yasen-class attack submarine will be laid down at the Sevmash shipbuilding company in the city of Severodvinsk in July 2017, the company's Director General Mikhail Budnichenko said Friday. "Seventh Yasen-class submarine will be laid down in July next year," Budnichenko said at a ceremony of laying down the sixth YasencClass submarine, the Perm. The Severodvinsk vessel has a submerged displacement of 13,800 tons, a length of some 390 feet, can travel at speeds up to 31 knots, and can dive to depths of almost 2,000 feet. The submarine is armed with naval mines, the Oniks and Kalibr anti-ship missiles and a range of torpedoes. According to Russia’s Naval Doctrine, the Yasen-class submarines will become the main multipurpose nuclear-powered subs in the Russian Navy.